There is a circle and there is a line. I’m in the line, queued in a posh Toronto neighbourhood between the man who just lost the race to be Prime Minister, and the country’s most powerful newspaper magnate. In line with us are writers, journalists, socialites, industrialists, all wending their way through the warm June evening to be received by Scott Griffin, the redoubtable patron, founder and host of one of the world’s richest literary awards, The Griffin Poetry Prize. Tonight is the annual Awards Gala, an opulent celebration of the written word at which Mr. Griffin will award two writers $65,000 each for having authored a winning book. He is a writer. In 2010, he founded a website called Free Saudi Liberals, where he briefly agitated for free speech, the separation of church and state, liberalism, feminism, and solidarity with his fellow free thinkers. “As soon as a thinker starts to reveal his ideas,” he wrote in August 2010, “you will find hundreds of fatwas that accuse him of being an infidel just because he had the courage to discuss some sacred topics.” Before long, he attracted the attention of his authoritarian state and by 2012, he had been arrested, and charged with apostasy, which carries a mandatory death sentence. His Wahabi Sharia judge was lenient, and in 2013 sentenced Badawi to six years in a Saudi prison, and six hundred lashes. When Badawi appealed the sentence, the judge increased his punishment to ten years in prison, and a thousand lashes, which are administered fifty at a time to the writer’s bare back on Friday afternoons. The eyewitness told Amnesty International what happened next. A man in uniform emerged from the circle holding a large cane and ordered Badawi to kneel. He raised the cane and for an instant it is stood straight as a radius before wailing through the air and bouncing off Badawi’s back. Raif raised his head and closed his eyes. The man in the uniform counted: one. Badawi’s wife and three daughters have fled Saudi Arabia, and live now as political refugees in the kind of country Badawi has argued Saudi Arabia could become: Canada. Two. In one of his final essays on Free Saudi Liberals, he quoted Albert Camus, a writer everyone in the line for the Griffin Prize Gala probably knows: “The only way to deal with an unfree world is to become so absolutely free that your very existence is an act of rebellion.” Three. When the man in the uniform has counted to fifty, Badawi is dragged back to the bus. For nineteen more Fridays, he will return to the circle. The circle and the line can never meet. Like the wheel of a car and its flat undercarriage, a shock absorber separates them. Scott Griffin produces that shock absorber. His company, General Kinetics of Brampton, Ontario, has a subcontract on the largest foreign trade deal in Canadian history. It is an arms deal — one that violates our own export regulations — negotiated by the Harper government on behalf of London, Ontario’s General Dynamics Land Systems, for the delivery of $15 billion worth of light armoured vehicles. A kind of tank on wheels, LAVs are one of the most formidable fighting machines ever conceived by the human mind. The purchaser is the Kingdom of Saudi Arabia, Raif Badawi’s jailor and torturer. For every single Light Armoured Vehicle the Saudis are buying from General Dynamics, Mr. Griffin’s General Kinetics is providing the shock absorbers. “Is he a killer, they asked? A criminal?” He is a writer. In June of 2012 Raif Badawi was arrested and I went to the Griffin Prize Gala. He and I were 29. But because I was born in Canada and Mr. Badawi was born in Saudi Arabia, our convictions, however similar, have had diametric consequences on our lives. According to the Economist’s Democracy Index for that year, I lived in the eighth freest country in the world and Badawi lived in the eighth least free, barely ahead of Equatorial Guinea, Turkmenistan, Chad, and North Korea. Badawi risked his life for his writing, while I made a living from mine. That year, I was working as the poetry editor of The Walrus and as the poetry columnist for The National Post, both Canadian institutions with well read and well heeled audiences. And so for a few years, every June I was invited to the Griffin festivities. Before the Griffin Prize, Canadian poetry was precisely as luxurious, and as lucrative, as you’re imagining—that is to say, not at all. Some poets are lucky enough to be tenured professors at universities, but most carve out precarious livings doing whatever will pay the bills between visits from the muse. Modest but crucial government subsidies to poets and publishers help buttress an art form for which there’s virtually no market demand or public interest. Books appear in print runs of five hundred copies, receive maybe a short review in one of the country’s mostly unread literary journals, then promptly recede into oblivion. A couple books each year are singled out, from the hundreds published, for one of the handful of prizes available to poets, the purses of which vary from the decoder ring awarded to winners of the ReLit Prize—a piece of jewellery which I imagine is even hard to pawn—to the $20,000 offered by the long-toothed and increasingly out-of-touch Governor’s General Award. But the real glitz is saved for the evening after the readings, the night of the Gala, where the winners are anointed as Scott Griffin produces their cheques, and shines his solar spotlight on an art form better acquainted with the shade. Three hundred and sixty three days a year, poetry plays next to no role at all in our cultural life, and W.H. Auden is right when he sighs, in his elegy to W.B. Yeats: “Poetry makes nothing happen.” Once a year though, on the night of the Griffin Gala, Auden is wrong. The first time I stood in the Gala’s receiving line, I was sandwiched between Michael Ignatieff, fresh off his federal election loss, and Conrad Black, fresh out of prison. The first time I stood in the Gala’s receiving line, I was sandwiched between Michael Ignatieff, fresh off his federal election loss, and Conrad Black, fresh out of prison. As a Canadian poet, I was nonetheless a thorn between two roses. The Gala is held in Toronto’s historic Distillery District, once home to the world’s largest distiller, Godderham and Worts, and now a sequestered playpen for downtown’s upwardly mobile. Entering the exquisite old distillery, I found the scale and opulence of the event intoxicating. Dozens of tables were appointed with vaulting floral arrangements. A legion of servers zigzagged slinging canapés. Past me walked former Governor General Adrienne Clarkson. Over there was the actor and director Sarah Polley. After dinner—which is so good it hampers conversation—I left my fiancée to go to the washroom and returned to find a strange man with his arm around her chair. It’s Jian Ghomeshi. The Griffin Prize, more than anything, is a validation of the vanity of poets, the poorest and most ignored of artists, who on one night a year can attenuate their self-loathing just enough to indulge their self-regard, and believe without reservation that we are, as Percy Bysshe Shelley called us, the “unacknowledged legislators of the world.” Inebriating as it was, I had to leave the 2012 gala early. The Griffin Trust had arranged for me to meet one of my heroes the next morning, the Nobel Prize winning Irish poet Seamus Heaney. They had flown Heaney in to award him the Griffin Lifetime Achievement Award, and asked me if I’d like to interview him. In the end, we would talk for an hour. He would tell me stories about Robert Lowell and teaching at Harvard, and would sign my weathered copy of his Collected Poems. A year later he was dead. If it weren’t for Mr. Griffin’s largesse, I would have never met him. I wondered: how did Scott Griffin make all that money? The night of the gala, I lay awake, thrilled, intimidated and a little drunk, running through Heaney’s poems in my head. In “Chekhov on Sakhalin,” he imagines the Russian writer destroying a glass of expensive cognac the night he arrives at a penal colony: “When he staggered up and smashed it on the stones/ It rang as clearly as the convicts’ chains/ That haunted him.” A few days later in Saudi Arabia, a writer I’d never heard of, Raif Badawi, would be in shackles. Drifting off, I imagined the damage my poet friends were probably still doing to Mr. Griffin’s pocket book by way of that open bar. Then for the first time, I wondered: how did Scott Griffin make all that money? Silver-haired, a trim and handsome seventy-seven, in a double-breasted navy blazer that can only be described as nautical, Scott Griffin takes the stage looking like Blue Rodeo’s Jim Cuddy dressed up as The Millionaire from Gilligan’s Island. He’s on YouTube, giving a TEDx Talk entitled “Why Poetry.” “Poetry is the essence of language,” he intones gravely, “and language is the mirror of the soul.” Ok, so as a literary critic, he’s no Dr. Johnson. Still, one can’t help but be convinced, over the fifteen minutes of his lecture, that poetry is fundamental to Scott Griffin. 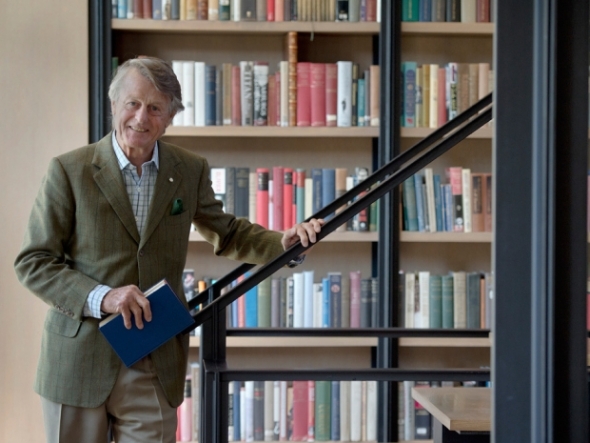 Later, after attending a boarding school that, in his Tedx Talk, he calls “a beat ’em up, keep ’em cold kind of place,” Mr. Griffin took a degree in English and Philosophy at Bishop’s University in Lennoxville, Que (where he would later become Chancellor). There, he encountered a transformative professor, Arthur Motyer, a Rhodes Scholar whose ability to reel off entire Dylan Thomas poems by heart made an indelible impression upon the young man. Then he graduated. In our interview, Mr. Griffin told me: “My father basically said, ‘your free life is over and now you’ve got to go and work.’ In those days, you took the first thing that came along, and I worked for BP—British Petroleum—for about ten or twelve years.” Soon Mr. Griffin realized that his true calling was the high-stakes world of venture capital. “I recognized there was more money chasing fewer deals,” he told me, and so in 1981, he “formed a manufacturing company in the automotive industry, and it got pretty big.” That company was Meridian Technologies, a magnesium die-casting concern originally based in Strathroy, ON, which by the mid-1990s employed two thousand people and banked, according to Mr. Griffin, about $175 million in annual sales. 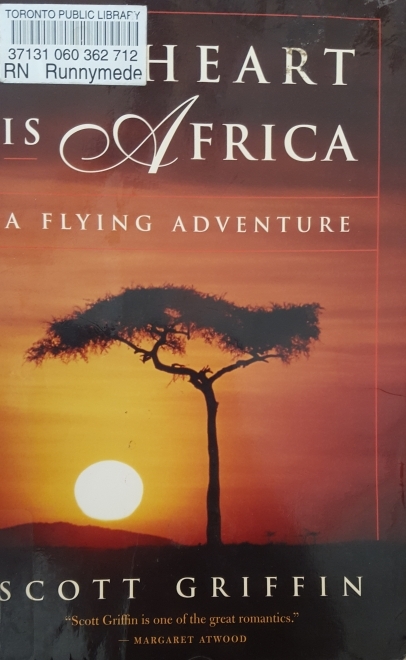 But as he writes in his memoir My Heart is Africa: A Flying Adventure, by 1995 Meridian Technologies, a publicly traded company, “had grown in size and prospects with two large international shareholders struggling to gain control. This eventually led to a boardroom tussle, which I lost.” Mr. Griffin calls what befell him after the ouster a midlife crisis. Casting around for an NGO that could use him, Mr. Griffin discovered the African Medical and Research Foundation, which ran something called the Flying Doctors Service of East Africa, a rag-tag air ambulance outfit that flew bush planes into remote communities—nearly always under dangerous conditions—to administer medical aid. He signed on as a consultant, on a two-year unpaid term beginning in 1995, to turn around the faltering and mismanaged Flying Doctors Service. “It was on those long solo flights,” he tells his audience at the TEDx Talk, “that I rediscovered the joy of reciting poetry.” Around the same time, he discovered the money to be made in manufacturing arms components. Ed Fast had a very good Valentine’s Day. On February 14th 2014 Canada’s Minister for International Trade stood on the production floor of the world’s fourth-largest defence firm, London, Ontario’s own General Dynamics Land Systems and announced the biggest foreign trade deal in Canadian history, The Armoured Brigades Program. Brokered by the Canadian Commercial Corporation, a crown outfit that negotiates with foreign buyers on behalf of Canadian exporters, the fourteen-year contract would be worth $15 billion. And every cent of that windfall would be spent on a single Canadian weapon of war, the Light Armoured Vehicle, and by a single foreign purchaser, the Kingdom of Saudi Arabia. The LAV is a multi-generational family of military vehicles manufactured at General Dynamics’ (also known as GDLS) London plant. In its most common configurations, it is an eight-wheeled fighting vehicle that looks like a small tank with wheels instead of tracks. Small, in this case, means weighing close to twenty tonnes. It can travel the distance between Toronto and Montreal—roughly six hundred kilometers—at 100 km/h without refuelling. Operated by a crew of three, it can ferry up to seven additional soldiers as passengers, who on command will pour out of the LAV and onto the battlefield. Any enemy unfortunate enough to be on the business end of a LAV will likely suffer the fate of the Light Brigade, theirs but to do and die. Armed with a 25-milimeter, three hundred pound chain gun with a range of three kilometers, there isn’t much a modern LAV can’t destroy: airplanes and helicopters, other LAVs, and of course people. It has the aura of some terrible, resilient insect, its many antennae rocking stiffly and synchronized as the whole vehicle recoils into its shock absorbers after it fires. With half of its wheels destroyed, it can still roar deliberately downrange. It has two secondary machine guns for use against personnel, as well as four grenade launchers embedded in its chassis. Its main gun can be replaced with weapons systems that range from a tank cannon to a mortar system capable of firing cluster bombs. Fully amphibious, it has rear propellers that allow it to ford any inland body of water. LAVs can even be parachuted into theatres of war from a C-130 Hercules. An earlier iteration of the vehicle, the LAV-25, saw action in 1989’s Operation Just Cause, when the United States invaded Panama ostensibly to oust its increasingly erratic dictator General Manuel Noriega, but also to keep its canal, which joins the Atlantic and Pacific Oceans, in the hands of a regime friendly to American interests. They were deployed in the first Persian Gulf War, when oil-rich Iraq’s Saddam Hussein invaded Kuwait and found himself on the wrong side of George H. W. Bush’s moral indignation. The Canadian military bought a few LAV-25s, christening them with the decidedly parochial field name “Bison” before sending them on our peacekeeping mission in Bosnia in 1992. But by the mid-1990s, both the American and Canadian militaries were recognizing the need for a more comprehensive update of the armoured personnel carrier. Working with both countries’ departments of defense, General Dynamics was awarded contracts to design and build the next generation of LAVs. 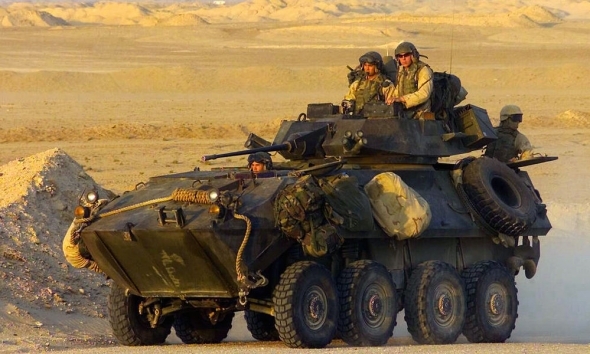 The Canadian Army ordered a total of 651 LAV-IIIs; the Americans ordered 4,466 Strykers, variations on the same vehicle. Ever since, LAVs have been big business for General Dynamics and the more than 500 Canadian subcontractors in its supply chain whose individual contributions are combined by General Dynamics to form the colossal fighting machine. Until recently, the United States was by far the biggest customer. But also lining up to buy the LAV have been Australia, New Zealand, and Colombia. And, most controversially, Saudi Arabia. As far back as 1992, the same year the Americans were forcing their way through the Iraqi desert, General Dynamics, with the help of the Canadian Commercial Corporation, minted its first arms deal with the Saudis, an order for 1,600 LAVs to be delivered over the next decade. That contract was an order of magnitude smaller than the enormous one proudly unveiled by Minister Fast this past February. Still, something made it very troubling indeed: the outfit writing the cheque to General Dynamics that year was none other than the Saudi Arabia National Guard. The SANG, as it’s known in military circles, is not the Saudi Arabian Army, whose job is to defend the country from external threats. The SANG is larger than the Saudi Army. It’s not even overseen by the Saudi Ministry of Defense. It is headed by Mutaib bin Abdullah, the son of King Abdullah, the country’s former autocratic ruler who died just a month before Minister Fast made his chest-thumping announcement on that factory floor in Southwestern Ontario. The SANG’s 125,000 soldiers are mostly Bedouin tribesman and Wahhabis loyal to the ruling family. (Until 1954, the SANG was called The Office of Jihad and Mujahidin.) And they have a single purpose: to act as a kind of mass personal bodyguard for the despotic house of Saud, defending the royal family from any and all internal threats. Threats like, say, the ideas of writers like Raif Badawi. The SANG is one of the key reasons there was not, and never will be, an Arab Spring in Saudi Arabia—or, for that matter, in neighbouring Bahrain. In 2011, the SANG made a rare sortie beyond the borders of Saudi Arabia, when the King of Bahrain, another Sunni autocrat, asked for help in dispersing the largely Shiite protesters who had taken to the streets to agitate for democracy. According to a report at the time from The Washington Institute for Near East Policy, “the Saudi forces arriving on the island are said to number 1,000, along with about 150 vehicles, including wheeled, light-armoured vehicles with roof-mounted heavy machine guns.” Those were likely Canadian-made LAVs. For a month in 2011, thousands of pro-democracy protesters had been camped out in the Pearl Roundabout, the central square of Manama, Bahrain’s capital. After the Saudi forces crossed the King Fahd Causeway into Bahrain, the country’s autocratic government declared a curfew, which came into force at four in the afternoon on March 16. An hour later, security forces, reinforced by armoured vehicles, tanks and helicopters, encircled the protesters and opened fire from all sides. Eight protesters were killed that night, hundreds were injured, and more than a thousand were arrested. By five o’clock, the Arab Spring in Bahrain was over. How many LAVs are the Saudis buying? The government isn’t saying. But according to Forecast International, LAVs cost, on average, about a million dollars each. So $15 Billion could buy as many as 15,000 LAVs, more than three times the number that the American military has ever purchased. In fact, despite the fact that Minister Fast proudly boasted about the deal when it was announced, the Harper government has otherwise remained stubbornly tight-lipped about its specifics—like which divisions of the Saudi armed forces will be piloting the killing machines—breaking its silence only to trumpet that it’s good news for our economy. Both the CCC report and Minister Fast himself have boasted that the Armoured Brigades Program is sustaining or creating more than 3,000 jobs—forty percent of those in Southern Ontario—over the next fourteen years. How many LAVs are the Saudis buying? The government isn’t saying. What remains to be addressed is how the Armoured Brigades Program meets the safeguards of our export standards. Saudi Arabia has one of the worst human rights records on earth, and has deployed LAVs against civilian populations to crush democratic protests. Women aren’t only banned from voting in the hereditary kingdom’s rigidly proscribed and mostly symbolic elections; they’re not allowed to drive. Its civil society is based on a strict Wahhabi interpretation of Sharia law. Thieves can have their hands amputated as official state punishment. Drug use and adultery earn death sentences, which have been carried out by crucifixion. Speaking of justice, in 2007, a woman known as Qatif Girl (after her hometown) sought Saudi’s version of it after she was abducted and gang raped by a former boyfriend and six of his friends. But because she had been conveyed to the location of her assault in a car by a man who wasn’t her husband or blood relative, she was found to have been in a state of khalwa—being alone with an unrelated man—and was sentenced to 90 lashes as punishment. When she told her story to the media, she earned 200 more, and the lawyer who represented her, known for taking on contentious cases, had his license revoked. The Canadian literary world, it turns out, is now intimately connected to the Armour Brigades Program, the largest—and maybe most heinous—foreign trade deal in our country’s history. It takes thirty seconds online to discover how. Go to the Griffin Prize website. Click on the About page. There you’ll find glowing biographies for all of the Foundation’s trustees. Somebody: singular. It’s not quite that few. But my question sends the vast majority of the free-thinking liberals I’ve asked into equivocating tailspins, rhetorical reverses, and magical thinking. An notable literary editor told me he thought Scott Griffin was a saint, even after I’d explained what General Kinetics makes. A professor at a prestigious American journalism school couldn’t see what the big deal was; when I asked if it was because shock absorbers weren’t “weapon-y” enough, he agreed. Too many people to count, including a former winner of the Griffin prize, have argued that being entangled at all in the contradictions of capitalism precludes me from interrogating this particular incongruity. After all, I used to work for The Walrus, which runs ads by Enbridge; I worked on this story at the Banff Centre, which is supported by energy companies; I on occasion wear jeans made in China. Many others have confessed that as a Canadian poet—starving for both cash and attention—they can’t afford to even consider whether supporting the prize, at the expense of like-minded liberal dissidents, may be morally compromising to our literary community, and to our souls. Eventually, I asked the one Canadian writer who can be counted on for clear moral thinking: Margaret Atwood. I sent her an e-mail noting that Mr. Griffin’s General Kinetics has a subcontract on the colossal Saudi-LAV deal, and asked what she thought it meant for Canadian writers who support the Griffin Prize. I asked Ms. Atwood in part because I’d seen her repeatedly Tweet about the plight of Raif Badawi while also being a Trustee Emeritus of the Griffin Prize. Ms. Atwood was also on a boat—presumably a different boat than Mr. Griffin—and had to wait a few days before responding. She eventually wrote back through her assistant. When I asked her if there was a contradiction at the heart of the Griffin Prize, she wrote: “I think it’s a Sophie’s Choice. On the one hand, conduct the business like a business, i.e. any dollar is the same as any other dollar. On the other hand, refuse to sell to some while selling to others, and lose all the business.” It may very well be the case that General Kinetics can not afford to turn down the subcontract on the Saudi deal. Under my note about our mutual concern for Raif Badawi, and liberal writers like him in the wake of the $15 Billion Saudi LAV deal, she interjected: “The Saudi regime could persecute Mr. Badawi with a piece of string. I don’t think those weapons are instrumental in such cases.” Here again, I can’t share Ms. Atwood’s certainty. In my research, I haven’t been able to definitively confirm which departments of the Saudi military or security forces will be outfitted with LAVs from the Armoured Brigades Program, though the enormity of the order suggests that the Saudis could be outfitting a great number of their security branches, including The Committee for the Promotion of Virtue and Prevention of Vice, which is in all likeliness the organization that executed the arrest of Raif Badawi. The Harper government’s refusal to discuss the sale is making any certainty on the matter—including Ms. Atwood’s—profoundly irresponsible. We do know though that the LAVs Canada sold to the Saudis in the 1990s were used for crushing liberal dissent, when they invaded Bahrain to brutally end its Arab Spring in 2011. “They are instrumental ie. in maybe keeping SA out of the hands of ISIS,” Ms. Atwood argued. There has been a great deal of speculation in the intelligence community that, although ISIS has blustered on social media that one of its eventual targets is the House of Saud, ISIS, essentially a marauding Sunni militia, is in fact also receiving a substantial portion of its funding from Saudi Arabia. Sir Richard Dearlove, the former head of Britain’s MI6 intelligence agency, told The Independent that he’s certain a great deal of ISIS’s financial support is coming from Saudi Arabia. A leaked, classified Pentagon brief calls Saudi Arabia its region’s “kernel of evil,” warning that it is “active at every level of the terrorist chain.” In a 2009 cable released by Wikileaks, then-Secretary of State Hillary Clinton warned: “Saudi Arabia remains a critical financial support base for Al-Qa’ida, the Taliban…and other terrorist groups.” Fifteen of the nineteen 9/11 hijackers were Saudi. So was Osama bin Laden. “Is it the weapons,” Ms. Atwood asks, “or is it the ill of those directing them?” That rang a bell. It’s the National Rifle Association bumper sticker, rephrased: Guns don’t kill people. People kill people. This is where Atwood begins to mount a robust defense of the arms industry. “Are all arms manufacturers bad?” she asks. “If the Allies had had no arm in WW2, Hitler would have won. Would that have been good?” For what it’s worth, it doesn’t particularly bother me that General Kinetics makes shock absorbers for LAVs that are sold to the Canadian Forces. I don’t even really mind that they end up in the US Stryker. I part company with General Kinetics on the Saudi deal. That said, most of the writers I know begin to froth at the mouth at the very word “military,” never mind “American military.” Scott Griffin himself said to me: “A lot of the literary world is probably anti the army or the navy or the air force, but you know suddenly you need them and they’re very pro.” He’s calling us duplicitous, but ours is a different sort of duplicity, one that actually works in Mr. Griffin’s favour; with it, he can get Margaret Atwood to defend his involvement in a Saudi arms deal by invoking Hitler. “There are no simple answers,” Ms. Atwood argues, “when it’s a choice of evils. One should try to choose the lesser evil, but how do you know you’re right?” Canadian writers, like almost all human beings, ground their morality in a rational self-interest, and the truth is that we can’t afford to question the Griffin Prize or the business decisions of its patron. As Ed Fast said of the Armoured Brigades Program, the Griffin Prize is too good for our economy—or so the conventional wisdom goes. I don’t want to kick poetry in the slats any more than Margaret Atwood does. I too have dedicated my life to it. But the Griffin Prize less supports poetry than a handful of poets. It has been around for fifteen years, almost a generation. Fourteen people have won it, out of the five hundred or so published, living Canadian poets. “Does a wrong cancel a right?” Ms. Atwood asked me. “Would seem to be the core question.” Powerful people have been giving writers prizes and patronage for a very long time, but it isn’t until the twentieth century, with the founding of the Nobel Prize, that the benefits to the benefactor become obvious. Alfred Nobel invented dynamite, from which he made his substantial fortune. In 1888, Alfred’s brother Ludwig died in the French city of Cannes. French newspapers reported his death but confused him with Alfred, and published his obituary under the headline “Le marchand de la mort est mort.” The merchant of death is dead. Alfred Nobel had the unenviable experience of reading his own obituary, and it wasn’t pretty. But after having made a killing from death, how do you change your obit from a pan to a rave? He needed a right to cancel his wrongs, as Ms. Atwood puts it. Nobel quietly amended his will so that upon his death the vast majority of his fortune was commuted to a trust that would disburse prizes, named in his own honour, for humanity’s greatest achievements in five categories—Chemistry, Peace, Medicine, Physics and Literature. With the stroke of a pen, Nobel became noble. James F. English, in his book The Economy of Prestige, calls this “cultural laundering.” Joseph Pulitzer isn’t remembered for the sensational, gossipy, ambulance-chasing “yellow journalism” he helped pioneer at his paper the New York World; with the creation of the Pulitzer Prize, his name is now synonymous with his profession’s Platonic Ideal. Jay Pritzker, English argues, made one of America’s great fortunes by propagating his aesthetically unremarkable Hyatt hotels around the world, then founded the Pritzker prize for architectural achievement. Peter Munk, the chairman and founder of Barrick Gold, the world’s largest gold mining company, may very well be remembered as the kindly old man with the Hungarian accent who brought Tony Blair and a dying Christopher Hitchens to Toronto to chat about religion for the Munk Debates. The Griffin Prize itself, in other words, is a shock absorber—intended or not—for its own, and its founder’s, reputations. As its patron travels over increasingly dodgy terrain, he can remain upright because his country’s most esteemed literati can equivocate themselves into coils. Ms. Atwood wrote through her assistant: “I am quite puzzled by his questions, as they come out of left field. It’s like saying should one go to the library funded by Andrew Carnegie because the latter was bad to unions, etc. Or should he be going to the Banff Centre considering the lethal effects of the oil industry, etc.” Even the mere inquiry, by a journalist and poet, into the contradictions of the Griffin Prize is a category error, and this from Margaret Atwood, who in March Tweeted to Rob Nicholson, the Minister of Foreign Affairs, petitioning him to do what he can to help Raif Badawi. That would be the same Rob Nicholson whose own Ministry’s export regulations clearly prohibit arms sales to the Saudis, guidelines which were established so that as a country we can avoid implicating ourselves in atrocities like the one that has befallen Badawi. Here is the essence of the national tragedy that is the Armoured Brigades Program, a flaw Ms. Atwood foresaw in us decades ago, which we can glimpse through the unlikely window of the Canadian literary world. It is true that a Crown corporation, the CCC, negotiated the contract with the Saudis. But they were doing so on behalf of a publicly-traded corporation, General Dynamics—which can’t afford to turn down such a colossal order—and the hundreds of Canadian companies in the LAV supply chain, none of which has chosen to refuse a subcontract on the deal of a generation. It’s for the same reason Canadian poets can’t afford to withdraw their support for the Griffin Prize: survival. But each of those Canadian firms agreed to make their portion of these weapons of war, and each of those vampires, as Ms. Atwood calls them, must bear the onus of the blood they draw. And yet no one touched by the Armoured Brigades Program can afford the luxury of exercising her conscience, not even the poets. It falls upon the back of Raif Badawi to bear the weight of our prosperity. I realized a few days after Ms. Atwood got back to me what made her responses especially odd and unsettling. Her most famous book, The Handmaid’s Tale, is set in the fictional Republic of Gilead, a theocratic military dictatorship where women are the chattel of a fundamentalist ruling class and free thought is violently suppressed. Their society’s only hope is an underground resistance called the May Day, who carry the torch of liberalism, feminism, and freedom, on pain of death. Raif Badawi is the May Day, and Canadian literature looks on, free to imagine Gilead even as we arm it. “We are in a state of waiting,” Ensaf Haidar says. I spoke to Raif Badawi’s wife, through an Arabic translator, on a Saturday. It was more convenient for me to talk on Friday, but Fridays aren’t good for her. As we spoke, she’d get distracted by her three young daughters, who were in tow with her as she fit me in between errands in Sherbooke, Quebec. They met by accident. Raif Badawi dialled the wrong number, and she answered. “We spoke,” she said, “and things developed from there.” He had already been publishing his essays when they met, and had been harassed by Saudi authorities. She married him anyway. “We believed so much in freedom of speech,” she said, “that even though we knew that we were risking our lives, we were not afraid.” When the Saudis revoked Mr. Badawi’s ability to leave the country, Ensaf and their three girls fled to Lebanon. Now she lives with us; we are her asylum. But on Fridays she waits. If the telephone rings, it could be news that the floggings have resumed—or worse. After Mr. Badawi’s first beating, in a sickening irony, his jailors deemed him too injured to receive his second. But since, the floggings have continued to be stayed only because of the pressure that the world’s writers have applied to the Saudis by reporting about his plight. “It gives me relief that the world is with us,” Ensaf says.